There’s been a lot of hype about Bullet Journaling in the stationery and organisation world recently, but what exactly is it, and what are the benefits? In this article I aim to answer all your questions, and help to get you started with your own bullet journal if you’d like to give it a go. A Bullet Journal is a flexible organisational tool you create yourself, which is entirely personalised to your needs and wants. The concept was created by Ryder Carroll, an Art Director and Interaction Designer in New York, who has shared his idea with the world via his website. You can use any notebook for your Bullet Journal, but many people opt for Moleskine journals or something similar to them, due to their small and neat appearance, and high quality. A small notebook is a good option, so you can carry it everywhere with you, in your bag or a pocket. Good quality, thick paper is a must too, so your ink doesn’t bleed through the pages. Whether the pages are lined, grid, dot or plain is your own personal preference. How do I start Bullet Journaling? Once you have purchased a notebook, the next step is creating a Symbols Key and making a note of this either at the front of your journal, or on a bookmark. This legend will be the basis of your new journal. Start off with the basics – you can always add more symbols when you’ve been using your journal for a month or so. These symbols are written before each note in your journal, to indicate what they are and what their status is. 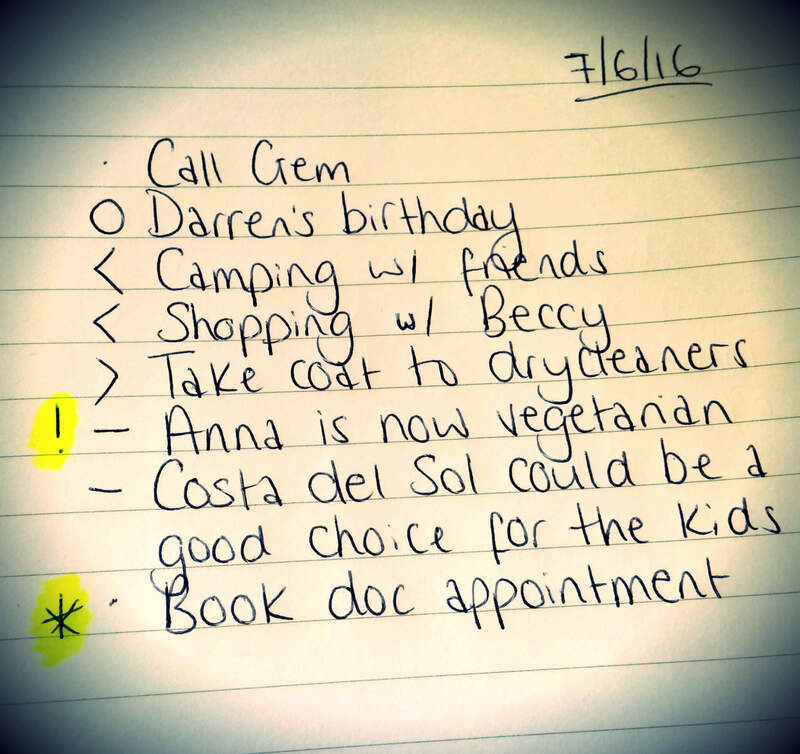 Tasks: A straightforward bullet (•) indicates a task that needs completing on that day. This bullet can then be updated to an ‘X’ when the task has been completed, a ‘<’ to indicate you’ve scheduled the task in, or a ‘>’ to indicate you’re carrying the task over to the next day. Events: An ‘O’ signifies an event to remember. Notes: Important notes can be jotted down with a ‘—‘. Sometimes you’ll need to be able to glance at your journal and find an important task or note really easily. In these situations, you can use signifiers next to (and preferably before) your symbols – these can be anything you like, such as a ‘*’ for priority tasks and a ‘!’ for something especially important. I recommend highlighting these signifiers, to really make them pop on the page. You can see bullet symbols and signifiers in action in the image below. You’ll also see I added the date – a very important step, and also you must remember to number every page of your journal. I’ll explain why shortly. At the end of every week, check through your bullets from the past week, and migrate any incomplete tasks that still need doing to a list for your new week. This way, you’ll not miss or forget anything. Mark them as ‘>’, and cross any tasks out that are incomplete but no longer relevant or necessary. The reason you must number your pages is so you can create an index for your journal – this way you’ll easily be able to find, for example, your February bullets if you need to check for something. The bullet journal can be whatever you want it to be. Use it to log daily tasks, upcoming events, books you’ve read, places you’ve visited… the journal is your oyster! Don’t be tempted to get ‘wordy’ – keep your journal to a simple list, however feel free to go into more detail about events that have occurred on the next page. Explore the original Bullet Journal website for more information on this fabulous method.